Stepped up law enforcement nets speedsters on U.S. Highway 151. 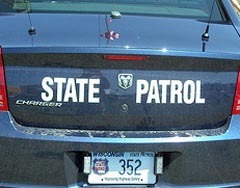 The Wisconsin DOT likely won&apos;t need much convincing to increase enforcements on the 220 mile-long 151 corridor, from Fond du Lac to the Iowa state line, after a nine day enforcement effort resulted in hundreds of citations. "We concentrated on the whole stretch of 151 in Dane County," says Dane County Sheriff&apos;s Office spokeswoman Elise Schaffer. "The Department of Transportation organized this effort. There were other departments that focused on the stretch of highway from Fond du Lac all the way down to the state line." Schaffer says Dane County Sheriff&apos;s deputies issued 194 tickets. LaFayette County Sheriff Scott Pedley says his officers wrote over 200 citations. "Speeds out on 151, from the Mississippi to Madison, are outrageous," says Pedley. "If this is a way to curb fatalities and injuries to innocent persons, then we&apos;re going to keep at it." Pedley says the average speed recorded by LaFayette County deputies was 81 miles per hour, though one driver was clocked at 106. The effort was requested by the DOT after numerous complaints about speeding on the 151 corridor.